Spring Pair’s counts have been delayed this year due to late falls of snow driven into deep drifts by ‘beastly’ weather from the North East. However reports from the lower lying North York Moors are very encouraging indeed although heather has been browned by gale force winds straight of the North sea. First indications of next season’s prospects come from the annual spring counts although this year we may not get any information from the high Pennine moors before Easter as they are still covered in snow. It may even be decided to dispense altogether with counts on these higher moors, leaving the grouse undisturbed to nest. Monday 13th, Tuesday 14th and Wednesday 15th August. Cumbrian grouse. 300 brace over 3 days.£50,400.00 + vat. Accommodation in good local hotel. Monday 20th – Thursday 30th August (2 or 3 days). Aberdeenshire grouse. 100 brace per day. £16,500.00 + vat per day. Accommodation in former Royal shooting lodge. Tuesday 28th and Wednesday 29th August. North York Moors grouse. 300 brace over 2 days. £49,500.00 + vat. Accommodation in delightful private home. Monday 3rd and Tuesday 4th September. Selkirkshire, Scottish Borders grouse. 180 brace over 2 days. £ 3,000.00 + vat per gun. 5 guns available in line of 9. Monday 3rd September. North Yorkshire grouse. 200 brace . £34,100.00 + vat. Excellent hotel accommodation available. Monday 3rd and Tuesday 4th September. North Yorkshire grouse. 240 brace over 2 days. £38,700.00 + vat. Excellent hotel or country pub accommodation available. Wednesday 5th September. 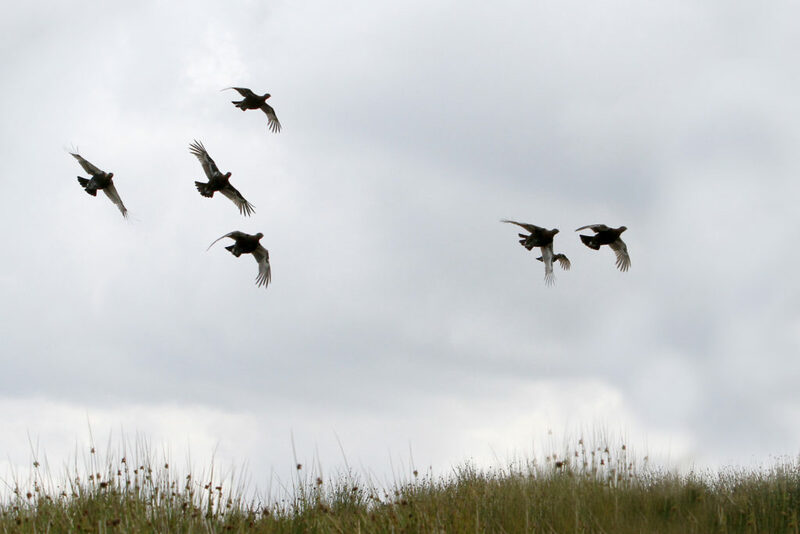 North Yorkshire partridges. 300 birds £1,567.50 per gun. 3 available in line of 8. Charming country hotel accommodation. Wednesday 12th September. North Yorkshire grouse. 125 brace. £2,750.00 per gun. 1 gun available in line of 9. Accommodation in either a very good local pub or excellent hotel. Monday 1st October. County Durham grouse. Monday 22nd and Tuesday 23rd October. North Yorkshire grouse. Monday 29th and Tuesday 30th October. North Yorkshire grouse. 240 brace over 2 days. £4,253.33 + vat per gun. 2 guns available in line of 9. If you have any specific requirement for next season please call us as the above list gives only a snapshot of some of the current availability and the picture changes from day to day at this time of year.